Paxos is the smallest of the Ionian Islands, located 7 miles south of Corfu. 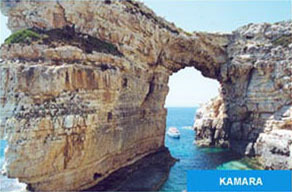 It is a very special destination, a small beautiful, unspoilt Island that captivates everyone that visits it. Paxos is suitable for couples and families wishing to visit true Greece and a paradise for walkers who can explore the unspoilt footpaths. 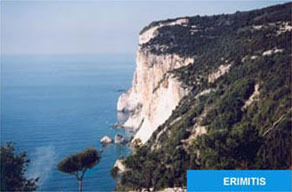 The etymology of the word, Paxos, comes from the Latin word "Pax" which mean Peace. This tiny Gem, just seven miles long and three miles wide captivates all who visit it with its endless olive groves that cover the whole Island like a green cloak, the traditional stone houses and more than one hundred churches all over the Island. The eastern coastlines of Paxos are smooth with beautiful pebbly beaches, while the western are bold and abrupt, with remarkable natural formations: caves, arches and sheer cliffs. Today, Paxos has a permanent population of 2,500 inhabitants, famous for their warmth and hospitality. During the summer months the Island welcomes more than 200,000 visitors from all over the world. 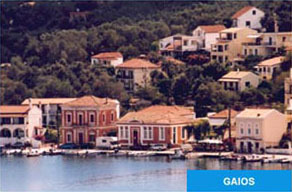 Gaios, the largest resort, is the Island’s Venetian style capital. Here quaint whitewashed houses cascading with flowers and narrow cobbled streets create an atmosphere of peace and tranquility with local shops and taverna's offering you hospitality, warmth and charm. The two arms of Gaios harbour are enclosed by the Isle of St Nicholas with its Venetian fortress built in 1423 in order to repel invasions and the little Island of Panagia with the beautiful white Monastery bearing the same name. The museum situated on the seafront gives you a glimpse of the way of life one hundred years ago. The town becomes lively and fun at the height of summer. It is a popular destination for Italians and its charming harbour fills with elegant yachts lending the place a cosmopolitan atmosphere. 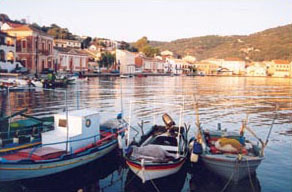 Lakka, at the northern tip of the Island, has a picturesque harbour fringed with taverna’s and shops. Typical of a Greek harbour by is narrow streets all leading to the square or the sea. 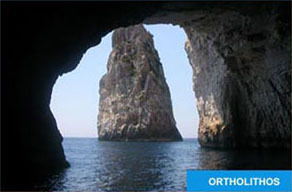 A scuba diving center is also based here with courses suitable for all, from novices to experienced divers. For those who love exploring, do not miss the opportunity to visit the Venetian House of Drihoutsi in the village of Grammatikeika, the lighthouse with uninterrupted views to Corfu and the Greek mainland and the Byzantine Church of Ipapanti. 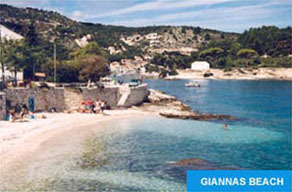 Moggonissi, is located just 3 km south of Gaios, this tiny Isle has a small sandy, man-made beach in a sheltered bay. There is also a bar / taverna with tables and chairs set outside. Worth visiting in Porto Ozias, before turning for Moggonissi, the ruins of the Paleo-Christian church of Agia Marina and Agios Stefanos on the top of the hill. Express boats run from Gaios during the high season or it can be reached by the coast road on foot or by taxi. 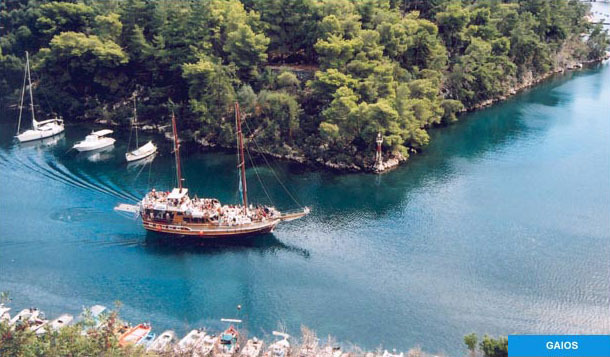 Loggos, the smallest of the three villages, is by far the prettiest and nestles midway between Gaios and Lakka. Traditional stone houses cluster around its beautiful little harbour with silver and green olive groves covering the hills surrounding the village. 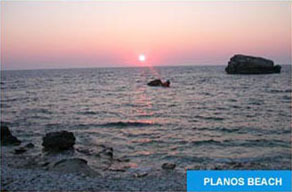 Loggos is famous for its delicious restaurants and has the perfect setting for wining and dining on a warm evening. The little bay is a glow at night with the lights of the taverna’s reflecting on the water, making a very romantic setting. Should you wish a peaceful day under the olive trees do not miss the opportunity to visit the fantastic pebbly beaches of Levrechio and Marmari just a few minutes walk from the village. The tiny Island of Anti-Paxos is an endless vineyard, it lies just one mile south of Paxos and it is famous for its beautiful white sandy beaches and translucent turquoise waters. The Island has a small resident population augmented by Paxiots who own vineyards and cottages. The little village of Vigla, in the centre of the Island has a maze of narrow walled paths leading to vineyards and small orchards of fig, lemon and almond trees. On the east coast, the exotic sandy beaches of Vrika and Voutoumi where the water is crystal clear superb for swimming and a safe place for children. The west coast is ideal for exploration. A walled pathway leads down a flight of steps to the only natural spring of Kaloiri, the pebbly idyllic beaches of Rodovani and Sarakiniko. A walk along the tracks to the south will bring you to a wonderful view of the light-house on the tip of Anti-Paxos and another islet known as Daskalia. During the day, in the summer, there are three taverna's providing shade, excellent food and refreshments. You can get there by hiring your own boat or get the skippered speedboats that depart from the square in the centre of Gaios frequently. Paxos is said to have been created by the Greek God of the sea, Poseidon, as a peaceful retreat for himself and his much loved Amphtriti. With one blow of his trident, he struck of the southern tip of Corfu and Paxos emerged from the waves. The strike was said to have been so violent that he lost his trident that was later found by Paxiots who made it in to their emblem. Throughout history Paxos has received an endless procession of visitors. Most of them have been hostile invaders, viewing Paxos as the gem of the Ionian, and one that every power wanted to own. From 229 BC until 733 AD the Island was part of the Roman Empire. Paxos was repeatedly attacked by pirates who severely disrupted the life of its residents. In 1386 the Island was conquered by the Venetians, who ruled for 411 years. In 1386 the Island was conquered by the Venetians, who ruled for 411 years. In 1386 the Island was conquered by the Venetians, who ruled for 411 years. From 229 BC until 733 AD the Island was part of the Roman Empire. 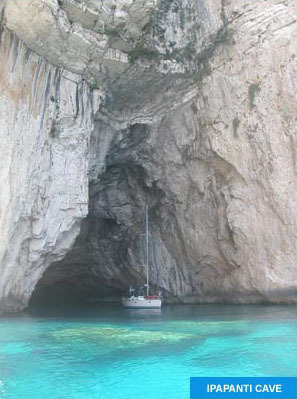 Paxos was repeatedly attacked by pirates who severely disrupted the life of its residents. In 1386 the Island was conquered by the Venetians, who ruled for 411 years. In 1797 it was surrendered to the Imperial French for two years. In 1799 Corfu and Paxos were occupied by the Russo Turkish siege . The French regained occupation in 1800 and remained on the Island until 1814. During this time the British blockaded the Island for a long spell and as a result many Paxiots died of starvation. In 1814, the English army conquered the fort of St Nicholas without any resistance and the Island fell under the British protectorate for 50 years. 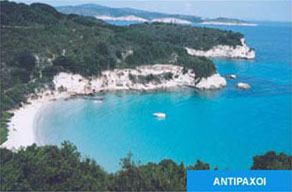 In 1864 Paxos amalgamated with Greece. However there followed the I and II World War, were many Paxiots offered their life to the struggle of freedom. Car Hire: is recommended should you want to explore Paxos although our houses are a 15 minutes walk for the main villages of Gaios and only 8 minutes to the nearest beach. Lakka or Loggos for those that prefer not to drive can be reached by the local bus service. There are four car hire companies offering a high standard of service. Bike and Moped Hire: is available in all three resorts. It is recommended for experienced riders. Please note that you are not covered by your medical insurance for accidents unless you possess a full driving license (covering the relevant category). Ferries, Hydrofoil & Sea Plane: during the summer months, there is a daily connection with the Island of Corfu and the Port of Igoumenitsa on the Greek mainland by either car ferry or hydrofoil. 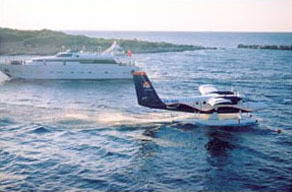 In addition, we now have a seaplane that connecting our Island with Corfu. Boat Hire: is strongly recommended, as its the best way to explore the Island allowing you access to beaches that are not accessible by road. This usually means that early and end of season that you will find your own bay for sunbathing or a picnic. There are local hire companies based in Gaios, Lakka and Loggos providing full equipment as well as instructions on operating and mooring your boat properly. Please note that the privately hired boats cannot be taken to the west coast or Anti-Paxos as it is prohibited for safety reasons.